Let Avanti Uomo and ContempoSuits.com introduce you to fashion style rugby stripe pattern dress shirts and tie sets to wear with your stylish looking suits. 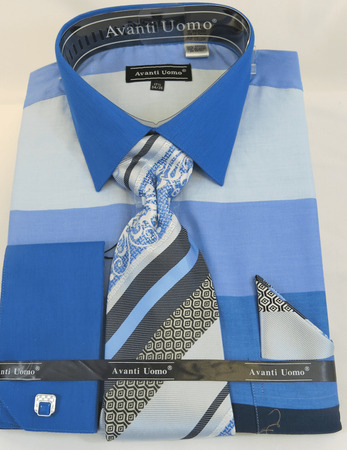 This is the type of dress shirt and tie set that Avanti Uomo is all about. Made of blue rugby stripe fabric with a matching big tie and hanky combo. This shirt has some serious head turning ability. Learn More About French Cuff Dress Shirts Here. Read How to Measure your Dress Shirt Size.